Students walk near the Library Tower on the first day of classes. Image Credit: Jonathan Cohen. Students walk near the Library Tower on the first day of classes. Photography: Jonathan Cohen. Lauren Dula, an assistant professor of public administration in the College of Community and Public Affairs, taught Nonprofit Management and Leadership for three years at Indiana University. Dula, from Wilkes-Barre, Pa. and Downington, Pa., received her bachelor’s degree in English and Applied German from the University of Iowa. She received her master’s degree in public administration from the University of North Carolina-Wilmington, and her doctorate in public affairs from Indiana University-Bloomington. She specializes in nonprofit governance (focusing on gender diversity in leadership positions) and volunteerism. 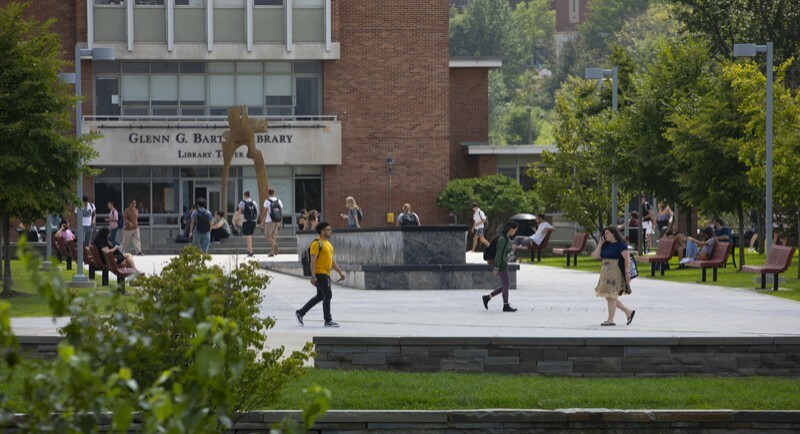 At Binghamton University, Dula will teach Foundations in Public Service and Nonprofit Leadership and Management. Her hobbies include being with her husband and 5-year old son; having squirt-gun fights; meditation; long walks and hikes; listening to podcasts; enjoying wine with friends; and reading fiction. Ali Khoshkhoo, an assistant professor of system science and industrial engineering in the Watson School, specializes in additive manufacturing, 3D printing surface metrology, and advanced manufacturing. Khoshkhoo, from Shiraz, Iran, received his undergraduate degree in industrial and systems engineering from the University of Tehran in Iran. He received his master’s degree in industrial and manufacturing systems engineering from the University of Missouri-Colombia, and his doctorate in industrial and systems engineering from Auburn University. He will teach Enterprise Systems and Advances in Additive Manufacturing Technologies at Binghamton University. Khoshkhoo’s interests include soccer, 3D printing, and foods. Ivan Korolev, an assistant professor of economics in Harpur College, specializes in econometrics, industrial organization and applied microeconomics. Korolev, from Monino, Russia, received his undergraduate and master’s degrees in economics from the Higher School of Economics and the New Economic School, respectively. He received his doctorate in economics from Stanford University. At Binghamton University, Korolev will teach undergraduate and graduate classes in econometrics. He enjoys spending time with his family, alpine skiing, soccer, tennis, volleyball and cycling. Hao Liu, an assistant professor of inorganic and materials chemistry in Harpur College, was a post-doctoral researcher at the Argonne National Laboratory near Chicago. Liu, from Shandong, China, received his undergraduate degree in materials engineering from the City University of Hong Kong. He received his master’s degree and doctorate in chemistry from the University of Cambridge. Liu’s research interest is in energy storage and conversion. He enjoys road cycling, hiking and movies. Blythe Roveland-Brenton, the head of special collections at University Libraries, previously served as the university archivist and associate dean of libraries at St. John’s University. Roveland-Brenton received her bachelor’s degree in anthropology and German from Binghamton University. She received her master’s degree and doctorate in anthropology from the University of Massachusetts-Amherst and a master’s in library science (with a concentration in archives/special collections) from St. John’s University. Her research interests include books as historical artifacts; portrayals of prehistoric people and world cultures in 19th- and early 20th-century children’s books; and undergraduate engagement with special collections and archives. Roveland-Brenton’s hobbies include museums, book and ephemera collecting, miniature books, 19th-century women’s scrapbooks and sketch albums, travel, and roadside attractions. Yuan Wan, an assistant professor in the Department of Biomedical Engineering in the Watson School, examines cancer-related diagnostics and therapeutics. Wan, from Jiangsu, China, received his undergraduate and master’s degrees from Southeast University in China. He received his doctorate in biomedical engineering from the University of Texas-Arlington. He worked as a research associate at the University of South Australia until his post-doc training at Pennsylvania State University for three years. Wan enjoys jogging, reading and movies.